Travel nursing can be a great opportunity to live a dream life doing what you love. Not only do you get to take care of people, you also get to travel to beautiful and interesting locations. To do that and still provide outstanding care to others, you have to stay comfortable wherever your travels take you. These easy solutions will soften the challenges you might face as a traveling nurse. Whether your travel nursing agency provides housing, a stipend or a choice between the two like Medical Solutions does, little details go a long way toward making your temporary housing feel like home. Some agencies provide furnished housing, which means you won't have to worry about the big items, such as a bed, dresser, couch, TV stand, or table and chairs. Depending on your contract, you may even get extras like a vacuum, a television, or cable and internet. But even if these things are provided or you're going the stipend route and finding your own housing, chances are good that your favorite brand of coffee maker, cookware and linens aren't included in the deal. Only you know what makes you feel cozy, so making a list of must-haves is a must-do for traveling nurses. Create a list of necessities, like small kitchen appliances, entertainment devices or exercise equipment, to take with you or buy locally to keep you comfortable in your temporary home. One of the joys of travel nursing is getting to work in new places, but along with that comes uncertainty and a lack of familiarity with the premises. During the first few days on shift, you may find yourself traveling the same routes multiple times before you can easily find your way around. Those extra steps can cause extra wear on your legs and feet, not to mention your nerves. Comfortable nursing shoes you can depend on ease that pain and keep you comfortable the entire time you're there. 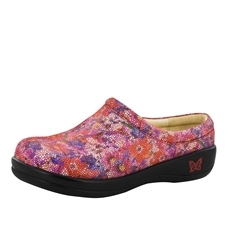 When you're dealing with first-day stress, the Alegria Kayla Pro Flora Fiesta nursing shoes can brighten your mood and calm your nerves with lovely lavender and pink tones. The Alegria Debra Viewmaster is another great choice to keep you animated and upbeat with its psychedelic patterns and movement. Your feet, legs and back will thank you for the added support you'll get from the contoured footbeds and excellent construction. Shoes aren't the only option for keeping your feet and legs comfy while you get used to a new place. Whether you work 8s or 12s, that's a lot of hours on your feet. Even though your body may be used to long hours at other locations, the added stress of familiarizing yourself with a new facility can wreak havoc on your body. Compression socks can help ease the stress by providing extra support for aching feet and legs. Sockwell's Travel Socks will keep you feeling great while you travel to your new destination and during your shifts when you get there. The soft but durable blends keep your feet comfortable and dry while enhancing your circulation. The Sockwell Women's Ascend Crew Socks give you great support with a non-roll top. If knee-hi socks are more your style, the Sockwell Women's Circulator is a win-win, available in 11 stunning colors. While you're finding the floor where all the supplies are kept or floating between departments, you may find yourself bending and flexing to reach everything you need to take care of your patients. Your assigned hospital may have different nurse-to-patient ratios and numbers of nursing assistants, too, which could mean more moving around than you're used to. You need scrubs that move with you and allow you to make the most out of your new assignment. WonderWink Easy Fit is a great look that gives you the flexibility you need with the fit you want. With a total of six easy-to-reach pockets, you'll be able to tuck away any notes and extras you need. The Med Couture MC2 Yoga Pant is another flexible option to keep you going. With flex fabric and a knit waistband, you're sure to stay comfortable each and every shift. Many traveling nurses keep their fur babies close at hand while they travel. "And they don't take up any space in a car, which is the way most of our nurses travel," said Kelly Grubb at Medical Solutions. Keeping pets happy will keep you happy while enjoying the traveling life. When you come home from work, especially if it's a temporary home, your pets can be the most comforting part of your day. Moving around may stress them out at first, but as long as they're with you, they know it's home. Make sure they travel with a few items they can depend on wherever you go. Take their favorite food and water dishes to make any house their new home. And don't forget to dress them up when you go out to explore your new site. A fun, customized bandana from Ripley & Rue is sure to be a hit with Fido and all your fur babies. Take it from travelnursingblogs.com, the authority on travel nursing, and Medical Solutions, one of 2016's top health care staffing companies: Comfort is imperative when you embark on a career in travel nursing. But with these items checked off your travel list, you'll be traveling in comfort and style.